וגם הערב רב עלה אתם - And the eirev rav also went up with them...(שמות יב:לח)- A person who wants to bring the wicked or Jews who are far away from serving Hashem closer to Him, for such a person there are great and limitless dangers. And he must employ a limitless number of ruses (for the kiruv) until he accomplishes his work completely. And therefore, Moshe Rabbeinu, peace be upon him, the master of all prophets where there will never be one like him again, didn't succeed in uplifting the eirev rav through his own efforts (with his hands). It was the eirev rav that caused all the tragedies: the sin of the golden calf, the breaking of the tablets, etc. And, the rectification for such things is via original Torah thoughts that are geared specifically to draw in those who are far [from HASHEM]...And he will stand before Hashem as a pauper and indignant, and he will beg of His mercy and compassion. 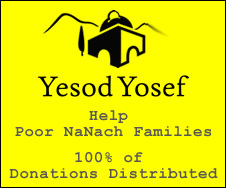 If Hashem yisborach will give then he will give. if not, then he won't. And, he should not push Hashem and should not excessively ask anything of Him, intentionally or by accident, until through His mercy and compassion He allows you to succeed in bringing in those who are far, those who are an aspect of the eirev rav. It's quite interesting that Reb Nosson advises one who seeks to be mekarev other Jews to use trickery and ruse. This advice probably reflects incidents that Reb Nosson saw first hand. It's well known that Rabbeinu interacted with some of the top maskilim of his day. When Rabbeinu was moving to Breslov he passed through Uman and met Chaikel Hurwitz and his sons-in-law, Hirsch Ber Hurwitz and Moshe Laundau, who were known throughout Russia to be very learned and respected doctors. Even the Russian Czar gave them golden swords as marks of honor. Chaikel Hurwitz heard that Rabbeinu was spending Shabbos in Uman, so he wanted to pay him a visit. Upon seeing Rabbeinu he said, "I heard that a great person had come to visit the town, and I wanted to pay my respects." "Then why don't you go see the important Russian general who's staying across the street?" taunted Rabbeinu, "He's more your kind of person." Chaikel was intrigued and came back later with his sons. Once they all arrived Rabbeinu was in the middle of saying Torah where he was analyzing a complex geometrical problem from Sukkah 8a. The three of them were quite impressed with Rabbeinu's knowledge of mathematics. Another incident involved these same maskilim. They came to Rabbeinu to ask him a question that their mentor could not answer. Rabbeinu answered their question leaving them in a state of awe. He saw that one of them was holding a book in Greek. He then proceeded to ask what it was, but every time they would respond, "Oh, this book isn't for you." Eventually he grabbed the book and quickly read a few pages. Once he returned it he immediately recited what he had read in Greek by heart leaving them astonished. What's remarkable about Rabbeinu's accounts with the maskilim is that his whole mission with them was to implant faith and Torah. But, he understood their outlook and attitudes, and used a very different approach with them. While warning his followers to stay clear away from them, he himself would speak with them for hours and totally avoid discussing even a word of Torah. It's interesting that after Rabbeinu passed away, Reb Nosson records that Hirsch Ber Hurwitz began to cry and said to Reb Nosson, "You miss the Rebbe? I miss the Rebbe! If the Rebbe had lived longer, I would have repented and become a truly God-fearing Jew!" It should be Hashem's will that the true Tzaddik will continue to bring those who are distant closer to Hashem and to His holy Torah.